This is the first edition of Talking God, the ninth book in Tony Hillerman's Navajo Mystery Series. The dust jacket was designed by Peter Thorpe and features the pictorial representation of Talking God in the center with Washington D.C. buildings and monuments to either side. Unlike many Hillerman novels, a great deal of the book takes place in Washington DC rather than in the Southwest. The book was designed by Alma Orenstein and published by Harper & Row. 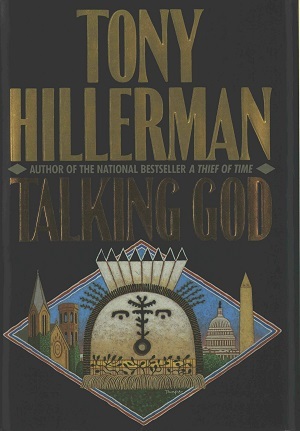 Binding: Light yellowish brown boards, deep purplish blue cloth spine lettered in bronze: [vertically] TONY HILLERMAN [decorative device] TALKING GOD | [horizontally] HARPER | & ROW. Illustrated multicolor paper jacket.